She was Bollywood's original "Dream Girl." It was in the late sixties that she made her debut in Hindi films. She is one of the finest actresses of all times who had received Film fare Lifetime Achievement Award and much-coveted award "Padmashree" recently. After creating a nice niche for herself as an actress, she found a new love in classical dancing and acting in small screen. Her first major role in small screen came in 'Yug' on Doordarshan's national network and had anchored 'Rangoli' in the same channel. Being already a name to reckon with in Bharat Natyam and Odissi, she decided once again go back to her dancing. 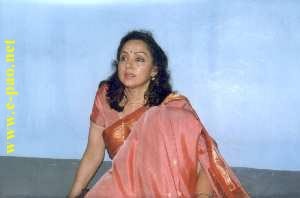 She did a series on Doordarshan and staged performances for audience in India and abroad. Her brief role of Kamal Hassan's mother-in-law in the bit controversial 'Hey Ram' has been widely appreciated. 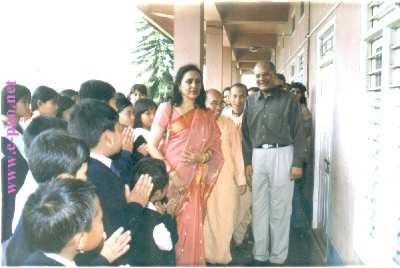 She is none other than Hema Malini: who is also a life member of International Society for Krishna Consciousness (ISKCON). She visited the state along with 30-member dance troupe on a charity mission for constructing Sri Sri Radha Krishna Chandra Mani Mandir at Sangaiprou, Airport Road recently. She had also attended two day seminar on "Science,Spirituality and the Future of Humanity"
organized by ISKCON which was held on April 30 and May 1 at the Jubilee Hall, Regional Institute of Medical Science, RIMS, Imphal. During her stay in the state, Atom Samarendra, Correspondent, e-pao.net managed to explore her enthusiasm in acting and dancing in the last four decades during her busy schedule at Imphal. The following is the summary of her replies in response to queries made by this correspondent during her brief visit in the state. E-Pao: After more than three decades in the film industry, do you feel that you've made a place for yourself? Hema Malini: I hope I've made a place for myself. That's what I set out to do when I took to acting. I just wanted to be known as good actress, or rather to be loved a lot as an actress. E-Pao: After finding a niche in the big screen, it now seems that your new found love is in dancing and acting in small screen. Are you getting bored with the big screen? Hema Malini: No! No! It is not a question of getting bored with the big screen. Acting and dancing has always been a serious interest of mine. I'm pursuing both my interests seriously. I would welcome any offer for occasional roles from selective filmmakers. But I want to keep myself away from the big screen for a while. I now have much more to do. E-Pao: How do you deal with your time as an enthusiast in religion, acting, dancing, and your responsibility in your family? Hema Malini: My daughters are grown up and are not demanding on my time. Dharamji doesn't mind me going back to acting and dancing. That is why I'm quite manageable with my time in pursuing my enthusiasm. E-Pao: Your daughter Esha Deol had also took step into Bollywood, was there any influence of you as a mother in choosing her career in the film industry? Hema Malini: Her choice of career in the Bollywood is absolutely her choice. It will be my right approach not to compel herself to anything in her self-determination. She has enough estimation for that. But on my part as a mother I've to impart my support and guidelines on the decision of her. E-Pao: Any comment on the kind of cinema that is being made in the Bollywood these days? E-Pao: What was your impression to the audience during your programme and specially the place and people here at Manipur during your brief three days stay in the state? Hema Malini: Wow! It's quite impressive. The applause from the audience that I witnessed in the jam-packed hall felt me quite affirmative to remark my performance as one of the successful stage performances that I ever did. The people of this lovely state are so caring and their hospitality shown towards me is excellent. It's a surprise experience and immense pleasure of mine at being visited at this land filling with heart warming natural beauty and its rich cultural heritage. I even didn't dream about such a wonderful and beautiful place. E-Pao: As a religious personality, dancer and as a celebrated actress, a word of message to the people of Manipur?